Ayin M. Adams, PhD. Msc.D., is a native New Yorker. She is also an International Metaphysician, spiritual director, and intuitive therapist. Adams is a holistic teacher of self-development and consciousness. Adams utilizes her gift of words to heal, educate, and entertain. Adams is the author of more than eight books. Adams has been published by “Women in the Moon” publishing, Bum Rush the Page, In the Family, and Quiet Mountain Essays. Adams is the 2015 Beverly Hills Book Awards Finalist for her book, African Americans in Hawai`i: A Search for Identity, the 2015 Bronze Medal Illumination Book Award winner, 1998 winner of the Pat Parker Poetry Award, the 1999 Audre Lorde Memorial Prose Prize, the 2001 President’s Award for Literary Excellence, and the Zora Neal Hurston/Richard Wright Award. Adams documents our passage in time using her writings and tonality of voice to help one break out of the current constraints and fragmentation of daily and habitual life. She assists and facilitates individuals to co-create their futures, especially as many of the established structures of society may be falling apart. Adams lives with the intention of suiting up, showing up, and following through. Adams embraces a firm belief that everything is in Divine Order. Ayin M. Adams organizes and leads spiritual retreats geared towards the transformational transcendence of mind, body, and soul. She makes her home in Maui. You may visit her at www.ayinadams.com. For the Love of Black Men is a triumph…filled with power, with poems reflecting the rich traditions and complexity of today’s black society. 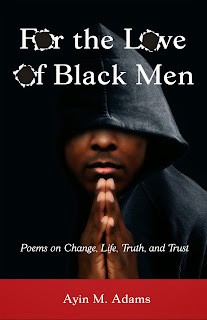 For the Love of Black Men is a thought-provoking, hard-hitting book of poetry that offers renderings of past and present indignities, self-introspection, spiritual commitment, forgiveness and the necessity of solutions. It probes areas that are not openly discussed. 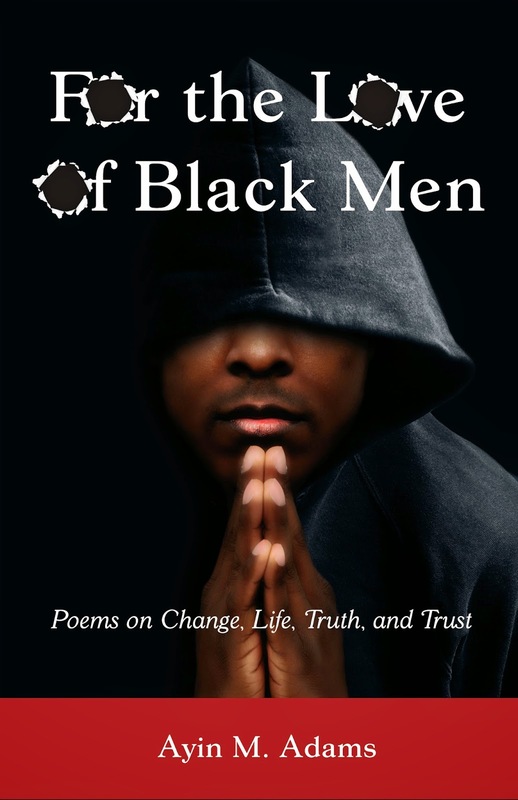 More than just a book of poetry For the Love of Black Men addresses issues credibly, compassionately, and directly, with a minimum of soft edges. For the Love of Black Men transports the reader on a personal and private tour into a realm where some Black men have had to wrestle and confront their own challenging questions concerning their wholeness. Many of the concerns these men have had to face may be similar to all men. However, because of the legacy of slavery, their obstacles are more. The wholeness that is being sought is always present, even in the most desolate of times. Trusting one’s inner source sometimes gives clarification to dilemmas that appear inconceivable. Many times silence or solitude are means by which answers are revealed. The fast-paced survival atmosphere in which most black men live does not provide such opportunities. In communities where there is a predominance of black men, the constant din of helicopters, fire-engines, sirens and other disturbances does not grant much contemplative time. For the Love of Black Men offers hope and the possibility of alternate choices. Ayin Adams’ poetry addresses the Black Man from a potpourri of issues. 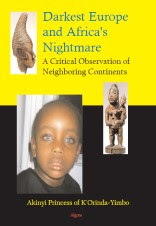 A gentle and compassionate rumination shared in the loving description of The Eyes of Father while the contrast of Sometimes I feel like a Fatherless Son and the brutally truthful concerns addressed in Hostage or Husband offer objective assessments. In more recent times, approximately fifty plus reported cases of unarmed black men have been murdered by policemen which is a continuation of the 1857 original statement concerning Dred Scott had no rights to sue, because the white man said that the black man has, “No rights which the white man was bound to respect.” Eric Garner, Michael Brown, Trayvon Martin were some of the victims who have given their lives…is an unsolicited martyrdom the ultimate reward for a Black Man, the final recognition that one never could have achieved on minimum wage or selling individual cigarettes with a second-class citizen mentality? The answers are always within, and the way in which we confront them will determine our happiness or unhappiness. For the Love of Black Men awakens us to a black man’s world in today’s American Society with searing poems that stretch from the street to the healing power of family and love. From the chilling immediacy of I Can’t Breathe (for Eric Garner) to the horrific truth of Unarmed, Adams tells apocalyptic moments in the Black community. Adams also encompasses the love, compassion and humor that connects the black man to the black community and to the world. Fortunately for all of us, Adams verses actually become a legitimate shelf reference of America’s shameful history of the slayings of unarmed black men. Butterfly Ingelozi® is an Illinois born native of the United States. A military veteran and college-educated, she lives her life through her experiences. Extremely analytical, she focuses solely on the purpose of every situation and every individual. Growing up in a close-knit family, Butterfly learned the value of character, integrity, loyalty and love (the action word). Writing came as second-nature to Ms. Ingelozi, though not her passion. She began writing as a means to disseminate information throughout her mother’s extended illness. 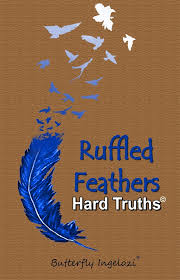 Writing then became therapeutic, allowing her to express her innermost thoughts, inadvertently revealing a uniquely spiritual and sensitive side, full of inspiration and encouragement, with an uncanny ability to uplift and educate. She writes from her heart and, unknowingly, finds a way to touch others through her words. A kindred spirit; kind, caring, giving, loving and trusting. But, don’t be fooled, Butterfly Ingelozi® speaks her truth and aims from the hip. A gentle person, Butterfly sails into your heart, melodically and humbly, with her truth and wisdom. What began as a means to disseminate information to close friends and family, all at once, became a legacy and a testament to an undying and unselfish love for family and life. This story is multi-layered. If you read and embrace it with an open mind, you will be amazed at what you take away. This story is about all of us, because each of us will pass through this storm some day (if you haven’t already). This book is for all of us. “Had I known to expect the unexpected many years ago, I wouldn’t have been so desperate, stressed, under duress or surprised. Had so many things not been family secrets in too many households for far too long, we all could have long ago helped each other with our experiences. Had I had access to the forthright experiences of others, I could have been better prepared to stage wars.” And certainly, this book would not have ever been relative. Although we all aren’t the same, nor will our experiences necessarily mimic one another’s, it is important that we share information and efforts when we encounter trials and endure tribulations in life. 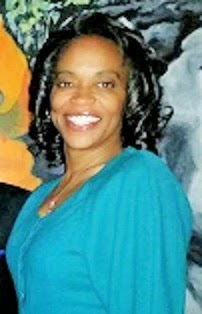 Author D. Elaine Fields is a member of Richmond, VA’s thriving creative community. Having fallen for the propaganda hook, line, and sinker Dawn Roberson is sure that she’ll never find a husband; after all young, professional African American females never do. She’s so eager for the man of her dreams in fact that when handsome successful Lawrence Moses crosses her path she’s more than willing to overlook a fatal flaw – he’s married. Convinced that Lawrence has already decided to divorce his wife Dawn dives head first into a love affair that she’s sure will deliver her happily ever after. Her choice throws the lives of others into flux as Lawrence’s unsuspecting wife discovers that her husband has moved on without her. The former Mrs. Moses finds herself suddenly free of the bonds of an unhappy marriage and hotly pursued by her first love – the man who’s never forgiven himself for letting her get away. My name is Reese and I’m a local Philly author. I started writing poetry at a young age, but for the most part kept my talent a secret. I’m a domestic violence survivor and was blessed enough to make it out of that relationship in 2009. I finally decided to published a poem book in 2013 after seeing a sign that read: “If God gives you a talent you need to use it”. 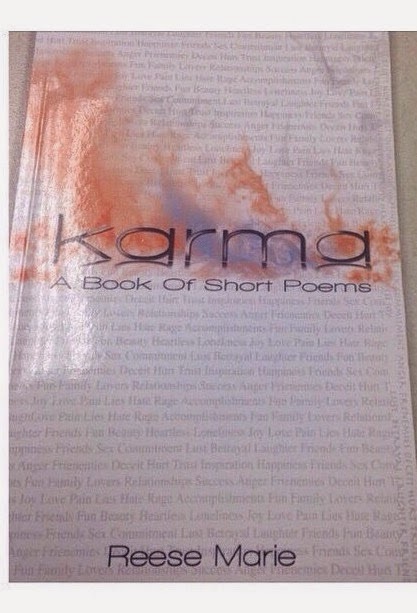 Karma consist of 25 short poems which are based on different life experiences that I have been through. Since the poems describe real emotions, and real situations readers are more likely to relate to what they are reading. 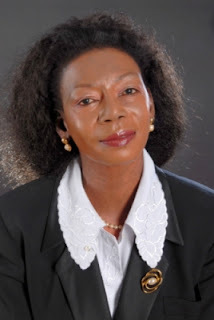 Spanish-born Equatorial Guinean Bisila Bokoko is the founder and chairperson of The Bisila Bokoko African Literacy Project (BBALP), non-profit organization whose mission is to promote literacy among the African people. 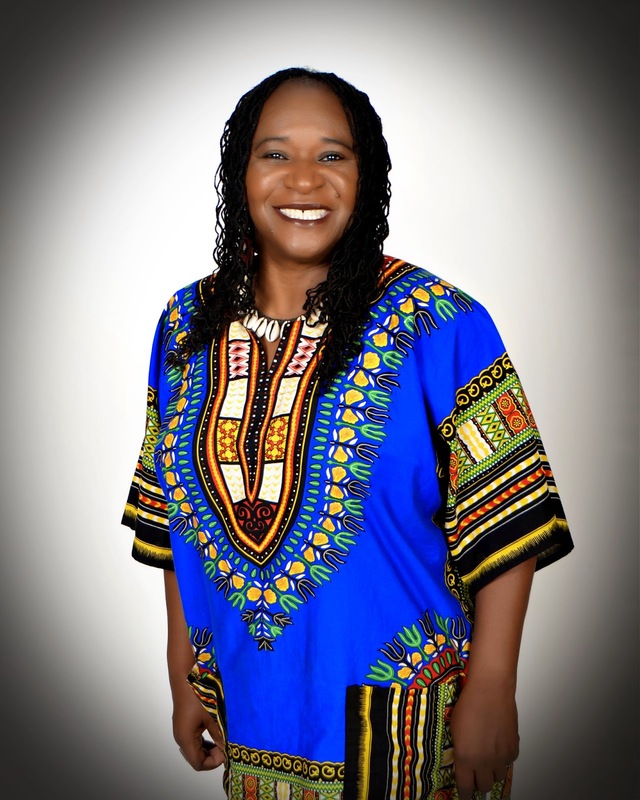 She has focused her efforts on organizing people and resources to build modern libraries in Africa. 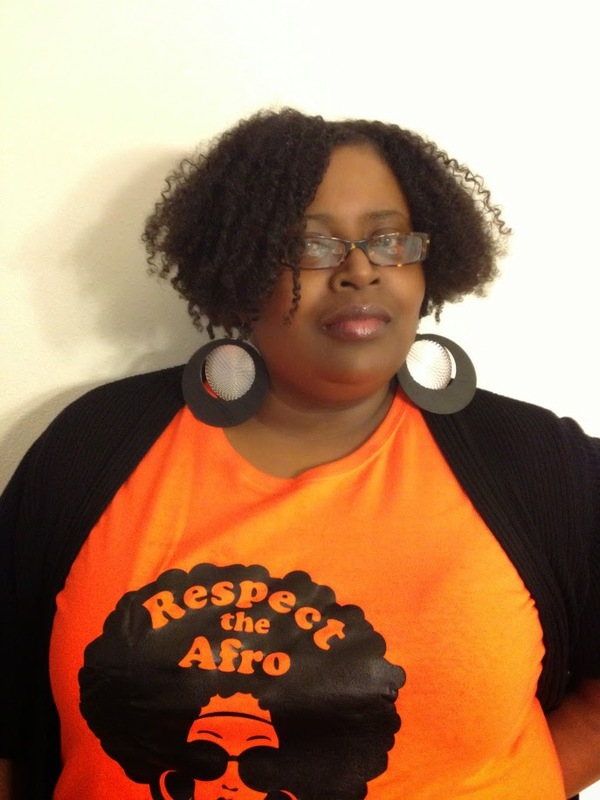 Lisa W. Tetting is the author of the novel, The Mistreatment of Zora Langston, and creator of Rebirthoflisa, her personal blog. She is a former call center supervisor, who, after much thought and angst, decided to change her life by living her dream. She grew up in a small town in North Carolina and loves that she is a Southern Girl. She has been happily married to her wonderful husband for a little over 14 years, and they currently reside in Tampa, Florida. 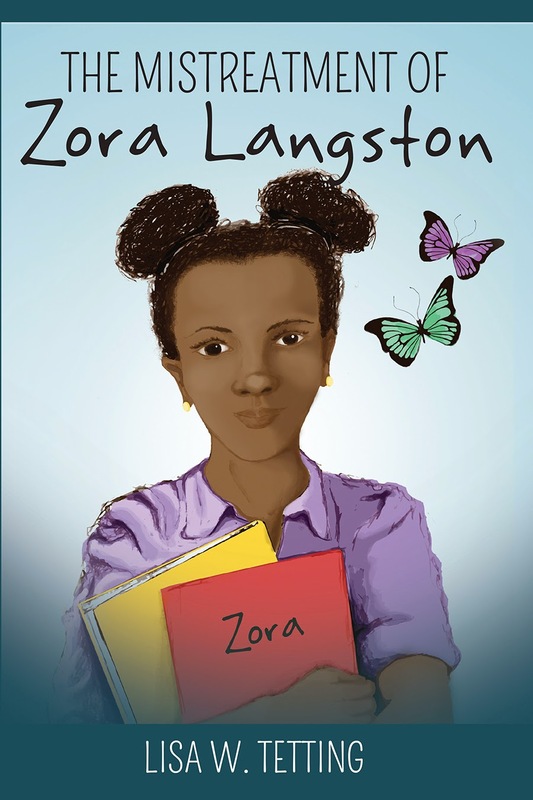 Zora Langston is nine years old when her father dies, leaving her in the hands of a mother who is anything but loving and siblings who never considered her family. Without her father, she is truly alone. Before the dirt has even settled on his grave, thereâ? ?s a new man of the house, and he has no interest in being Zoraâ? ?s father. Despite her hardships, Zora remains true and allows faith to help free her from this new, horrible life sheâ? ?s found herself in. She finds solace in her aunt and uncle and, for the first time, starts to discover what itâ? ?s like to have a real family. However, just when she thinks she has escaped her tormentors, new abusers emerge, old ones return from hiding and she must find the strength to survive.